You poor dearies! Your coffee must be stone cold by now. I have been remiss. I meant to write something yesterday so it could self-post. (Love that feature.) But, alas, a dear friend came over and brought a dear bottle of J champagne which is oh-so-yummy and all my good intentions went up in bubbles. My little naughty. I apologize. 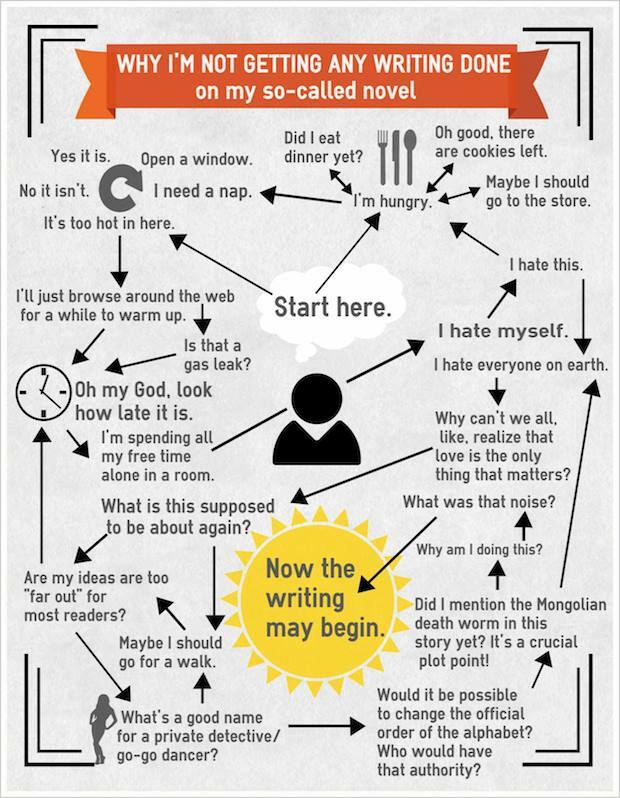 Here’s a great diagram of a writer’s mind as they’re crunching out their next great novels…I do not know who came up with this marvel, so I can’t credit them. I got it from an author I am taking a class from over at savyauthors.com…Linnea Sinclair. Love her books. They’re space adventures sprinkled with love and fabulous writing. But please, before you pour over it, pour yourself a new cuppa. I’m wracked with guilt. Have a great Sunday and a great week, peeps!! I know. It’s fabulous! I sure wish I knew who authored it so I could give them their dues. So you are braving the reunion!? Perhaps I will think about it– Also, I am reading your novel Walkers- what fun! You can still imagine a great story. Reminds me of our high school days when we’d spin some great imaginary lives. Thanks for the story! Thanks Vivia. Happy you are enjoying my book. I do hope you come to the reunion. It’s been awhile since I’ve laid eyes in you. It has been- what, 20 years or so. Actually more likely that I’ll see you on your own turf in late June when I come out for a conference- I sure hope so anyway! Would love to see your redwood forest. And yes, I am enjoying your book- keep on writing!